Brilliant yellow flower make Conostylis bealiana a very attractive low growing plant for sunny well drained positions. Another brilliant plant from the south of Western Australia, Conostylis bealiana is a winter flowering prostrate clump forming perennial. The flowers are a bright golden yellow, held down in the foliage but putting on a brilliant display. This is a plant that spreads slowly by underground rhizomes and will form a dense clump over time. A sunny position and a well drained soil are both essential. If needed mound up the soil to improve the drainage. Consider growing Conostylis bealiana in a container, it is a very showy plant when in full flower and has attractive foliage through the year. Propagation is easy from seed, also possible by division. By division you will need to wait until the clump is large enough to remove a small part from the site ensuring it has some root system. It is not recommended to dig and divide. Position – Sun to a little shade. Soil – Well drained with a dry summers. Flowers – Bright Golden Yellow, tubular and flared. C. argentea – Silver Conostylis with creamy white flowers. C. seorsiflora subsp. 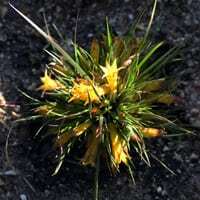 seorsiflora, a low growing mat forming species.